Moldova’s IPRI score increased by 0.823 to 4.002 placing it 24th in the Central Eastern Europe and Central Asia region and 115th in the world. Moldova is classified by the IMF as part of the Commonwealth of Independent States group and by the World Bank as Lower middle income country. Moldova’s Legal and Political Subindex increased by 0.037 to 3.399 with scores of 1.832 in Judicial Independence, 3.928 in Rule of Law, 4.755 in Political Stability, and 3.081 in Control of Corruption. Moldova’s Physical Property Rights Subindex increased by 2.275 to 5.785 with scores of 3.839 in perception of Property Rights Protection, 9.801 in Registering Property, and 3.716 in Ease of Access to Loans. 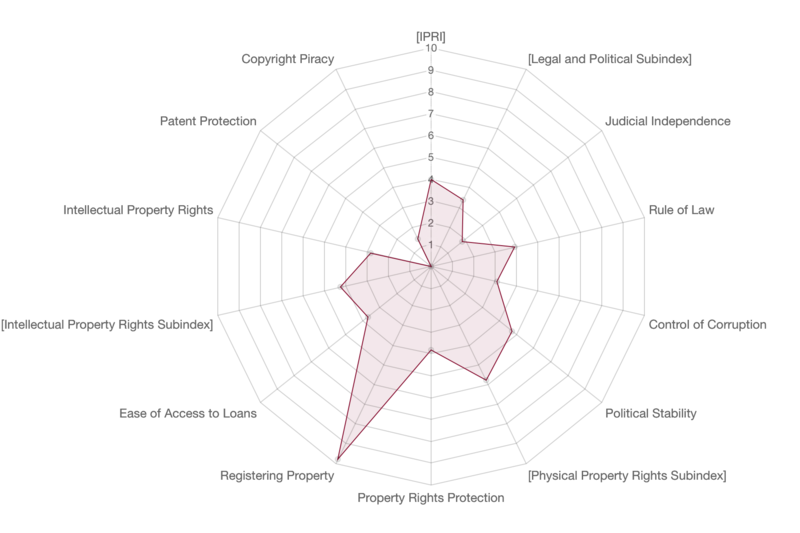 Moldova’s Intellectual Property Rights Subindex increased by 0.158 to 2.820 with scores of 4.241 in perception of Intellectual Property Protection, data wasn't available to measure Patent Protection, and 1.4 in Copyright Protection.